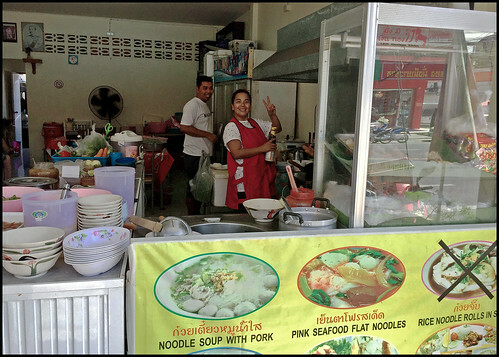 Along just about any street in Thailand you're going to find small restaurants and street stalls selling all kinds of Thai food. These places don't normally look very fancy, and many tourists will not really consider this kind of restaurant, preferring something nice at the hotel or a restaurant with a chance of some western food, or something they have found online with lots of good reviews. At the same time, many tourists want "proper Thai food" and (in my opinion) this can be hard to find in the more touristy areas of Phuket. If you want good, cheap local food you normally have to get away from the beach onto the back roads and find where the locals are eating. I don't normally blog about this kind of restaurant because there are so many of them and my advice is .. try a restaurant like this. If it looks clean and friendly, go for it! I'm going to give Pim's Kitchen a mention because I eat here quite often! It's about 1 minute walk from where I work at Sunrise Divers on the back road in Karon. I might blog about a couple of other options in the same area, the places that I go for lunch. Not dinner, only lunch. My house is 20km from Karon, so I don't really ever visit the main beach areas at night. If we eat out as a family it will normally be around Kathu or Phuket Town. 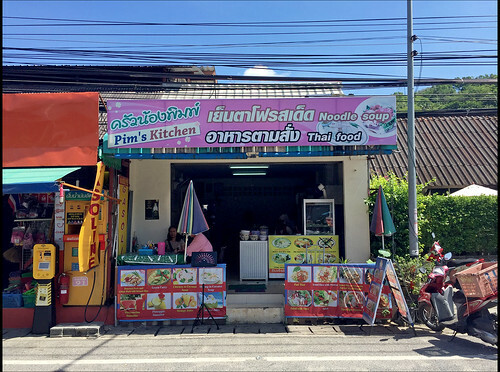 Pim's Kitchen opened in 2015 and is run by a lady called Sai who used to be working at the nearby Pineapple Guesthouse. Pim is her daughter's name. It's by the main road called Patak Road behind the beach road of Karon. Only a few minutes from the Hilton or Thavorn Palm Beach resorts, next door to a hardware store and opposite several banks. When it opened it was immediately popular with local workers like the bank staff. And me! I do like having cheap, tasty Thai food without having to walk far from the aircon office! (above) Sai is always rather jolly. And (bonus for tourists) she speaks decent English too! 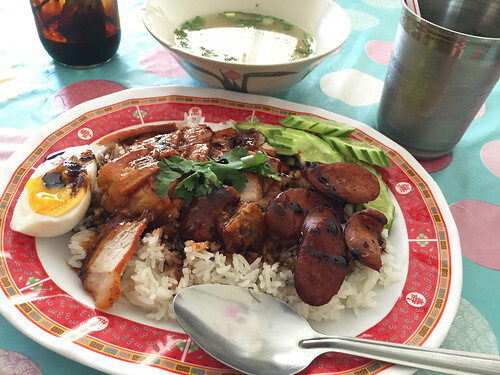 You can get a menu, or just think of any standard Thai dish and you can probably get it. And it will cost around 50 - 60 Baht. hey do a decent bowl of noodles (and it's big too!) 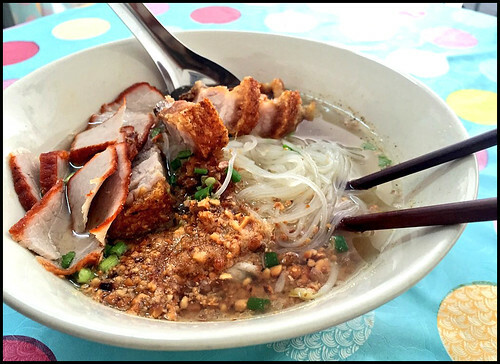 I like noodles with lots of crispy pork and a spoonful of crushed nuts. (above) A nice big bowl of noodles for lunch! It's a simple place inside, just half a dozen tables. If you want a drink you grab a cup from the back and help yourself to ice. There are beers and soft drinks in the fridge or you can just have free water. Another plus point! I like local restaurants that don't charge for water. I mean, you can get 20 liter bottles delivered for 10 Baht, so charging for a cup of ice and water is a bit cheeky. 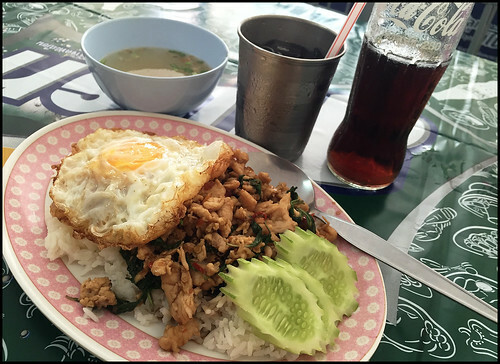 Another easy meal in Thailand is chicken or pork on rice (with chicken = khao man gai, with bbq pork is khao moo daeng, and with cripsy pork is khao moo grob). I like to mix the pork and (if they have it) add a few bits of chinese sausage (goon chiang). This comes with some sauce which you can pour over the top. Add half a boiled egg and some soup and that's lunch (see photo below)! 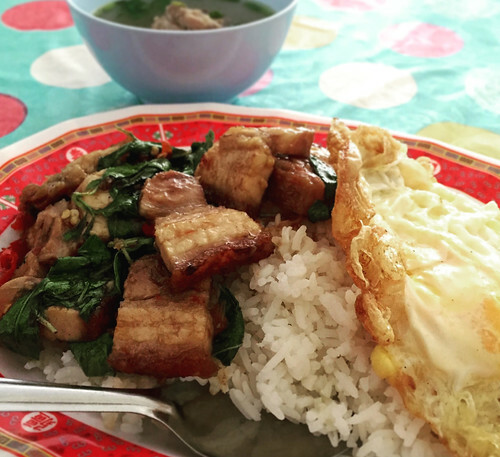 Or you can get Grapow with crispy pork (above). Look at that! 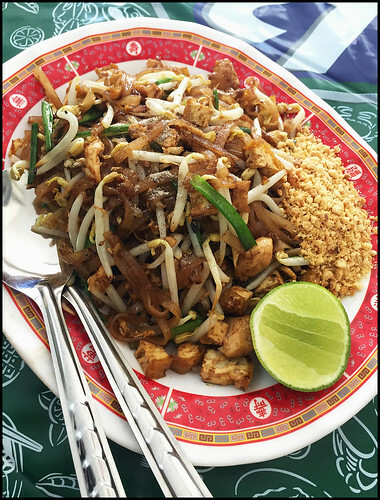 (above) And they do a tasty Phad Thai too!